The Natural Wood Table brings pure nature to your office or home. Each piece of wood is uniquely different. Hand placed butterfly ties are inherent in natural wood slices. Sap rings are left in place and the entire wood is hand finished. This is a beautiful wood table top sits on wood open rectangular legs at seated height or standing bar height. The Natural Wood Table is offered in standard sizes around 76″ -96″ with varying depths. Tops are about 2″-3″ thick. Bases in black, white or silver powder coat finish. The Natural Wood Table is offered with a power and data option. 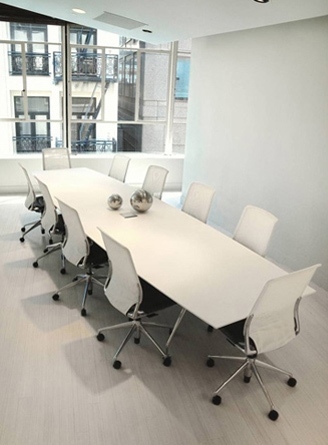 Looking for top quality table with warm to take off the hard edge off corporate spaces this is a great option. This departs from the standard conference table of past years. New design and concepts are evolving here in the US furniture market. We’re so glad the manufacturers are changing gears to meet market demands. The Natural Wood Table is built to order on about a 7-8 week standard lead-time. Wood tops are offered in different styles available as cut. Photos to be provided for choosing your unique table. Tables can be configured in long runs.